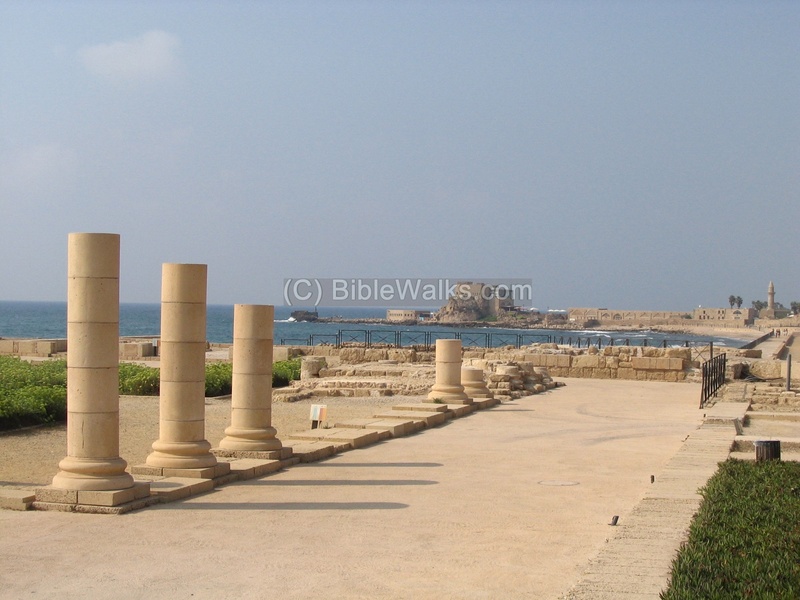 Caesarea Maritima ("by the Sea") is one of the most important cities in the Roman World, and a Crusader fortress along the road from Acre to Jerusalem. Caesarea Maritima ("by the Sea") is located on the shore in the center of Israel, in the middle between Haifa and Tel-Aviv. It is the site of one of the most important cities in the Roman World, the Roman capital of the province of Judea at the time of Jesus, and a Crusader fortress along the road from Acre to Jerusalem. 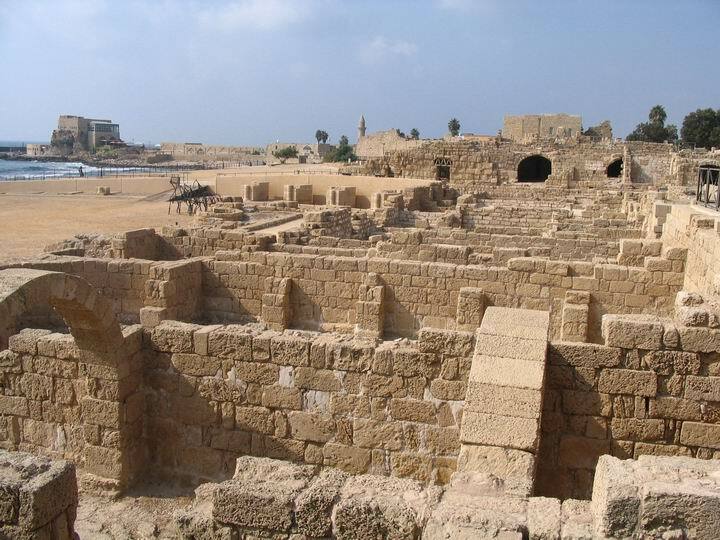 Today, Caesarea is a large and interesting national park which and a mandatory place to visit while exploring the Holy Land. 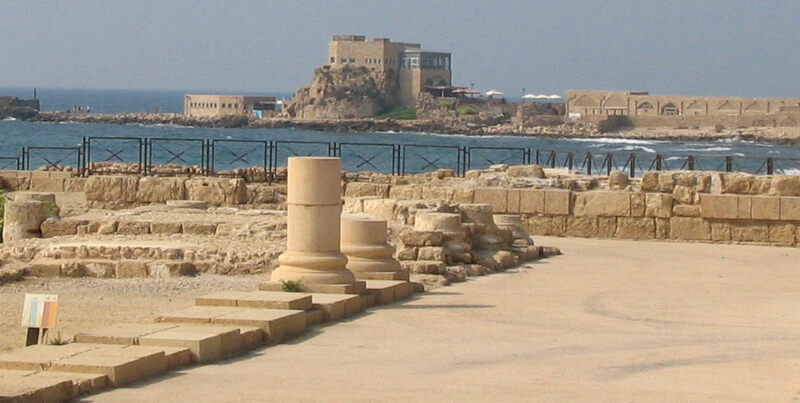 Initially, Caesarea was a Phoenician site in the Persian period (6 to 3rd C BC). The Phoenicians, the maritime merchants of the ancient world, used the natural bays and the nearby rivers in order to establish a port, one of many ports that they set up along the shore stretching from Tyre down to Gaza. The city flourished at the Greek period. Later, in the Roman period, King Herod created it into one of the largest cities in the Roman World, and called it after his patron, Augustus Caesar. 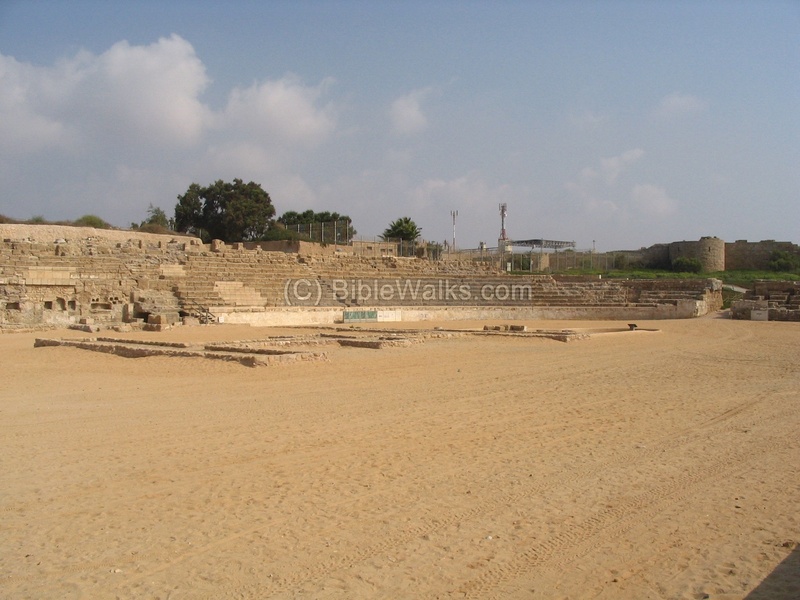 The site was an important Roman city, and played an important role in the history of Ancient Israel. The city later decayed after the Arab conquest (8th Century AD). Caesarea returned to glory with the Crusaders (13th Century). After their retreat the city was left in ruins, and its stones were reused in buildings throughout the region. An aerial view, captured by a drone 80m above the southeast side, shows an overview of the ruined Crusaders fortress. Notice the moat along the exterior sides of the walls, the towers along the wall, and the harbour. Another view, from the northwest side of the Crusaders city, shows the ancient harbour on the right, the restaurants and parking area on the left side, and the south part of the Roman city in the background. The Roman city was a major sea port, which included large warehouses to store the goods, and a large harbor that was built by Herod. This aerial view shows the north side of the ruins of the Roman city, adjacent to the Crusaders fortress. In the photo below - the vast harbour warehouses. In the left background - the place of the ancient harbor. In the far right background, the remains of the two-level building which was the Governor's house. This was probably Pontius Pilate's house. This aerial view shows the south side of the Roman city. Along the shore is the long Hippodrome. 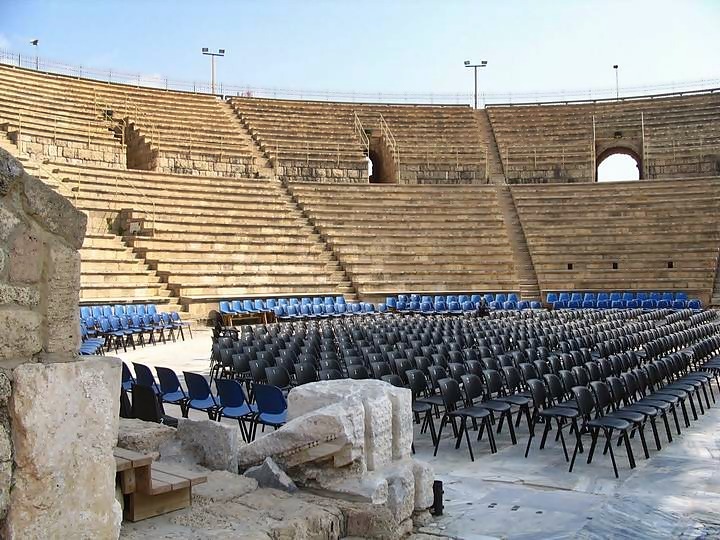 A grand entertainment place was built by Herod near his palace - a large Hippodrome in the shape of a long "U" (50 X 250M), with 10,000 seats in 12 rows. In this amphitheater the Romans conducted horse race (Hippo in Greek), special events, and games. As can be seen in the photo below, the seats were organized around a large arena. On the left side is the remains of the the central stage where the rulers and most distinguished guests watched the games. The Roman-Jewish historian Josephus Flavius tells about a famous event that happened in this site. It was between Pontius Pilate (the 5th procurator of Judea who ordered Jesus crucifixion; AD 26-36) and Jewish citizens from Jerusalem, who were offended by his acts of placing the military signa (flags) of Tiberius in Jerusalem. They conducted a sitting protest at his house for 5 days in order to remove the flags. On the 6th day he collected them in this site and threatened to kill them unless they accept the display of the Caesar's military signs (Wars Book 2, Chapter 9: 3), as follows: "On the next day Pilate sat upon his tribunal, in the large Stadium..."). Eventually, Pilate backed up and removed the signa to diffuse the explosive situation. South of the Hippodrome is a Roman period palace, stretching into the sea. The aerial view shows the palace on the right side. On the left side is the Roman theater. The following photo shows a closer view of the ruins of the palace. In the background: the Crusader's city, Ottoman mosque and buildings, and the ancient port just behind them. A large Roman theater, built by Herod, is located at the southern side of the city. The theater is still in use today for concerts and shows. In addition to this theater, Herod also built an additional amphitheater for the pleasure of the citizens. 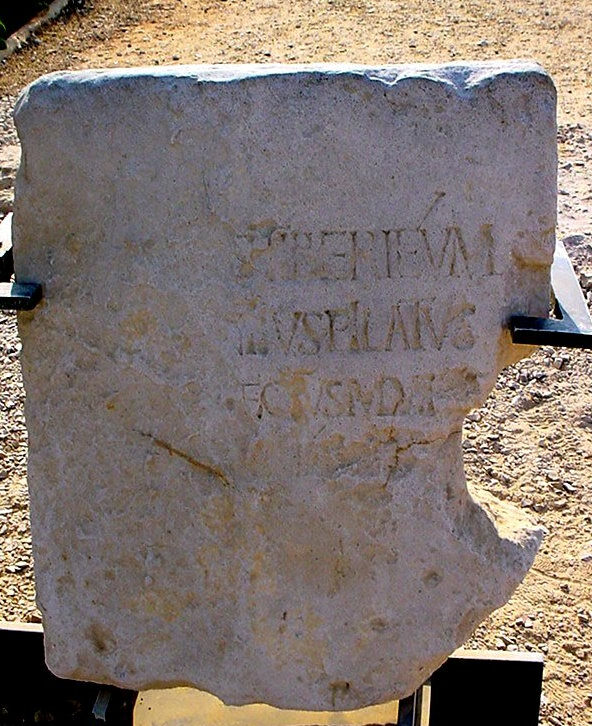 Near the amphitheater, a stone tablet was found with an inscription of the name Pontius Pilate, and dedicated to Tiberius Caesar who nominated him as procurator. This tablet probably tells that Pilate consecrated a temple of Tiberius in Caesarea. The tablet says: "Tiberieum, Pontius Pilatus, Prefect of Judea". This is an important evidence of the existence of Pontius in Caesarea. 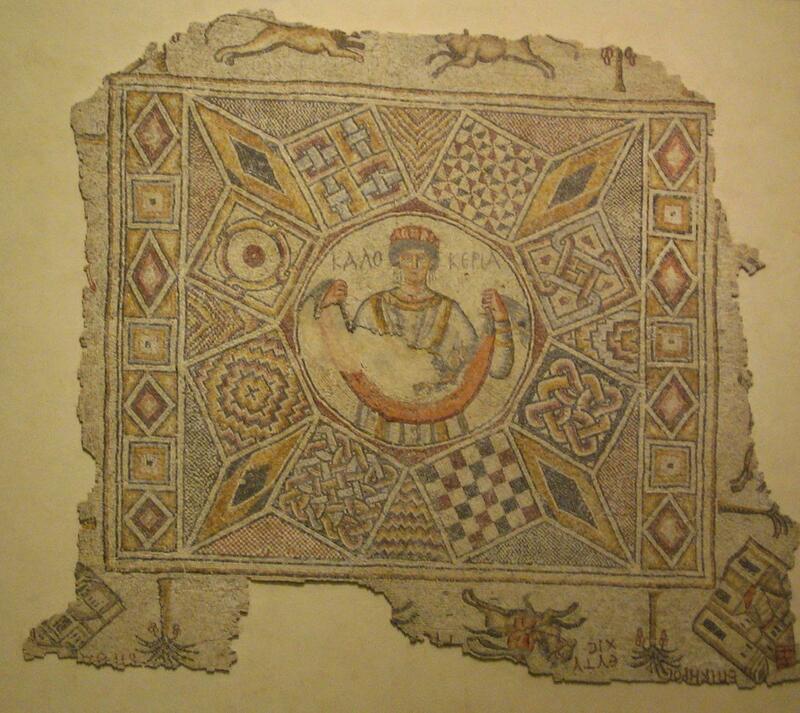 Many mosaic floors were excavated in the ruins of the Roman/Byzantine city. An example of such mosaic is on display in the Ben Gurion airport. This 6th C AD mosaic floor is decorated with animals, geometric shapes, animals and trees, and in the center a woman holding a fruit basket. Her Greek name, Kalokeria, is inscribed around the figure and suggests prosperity. This is the spirit of the city: fruitful, large, plentiful, a good city. 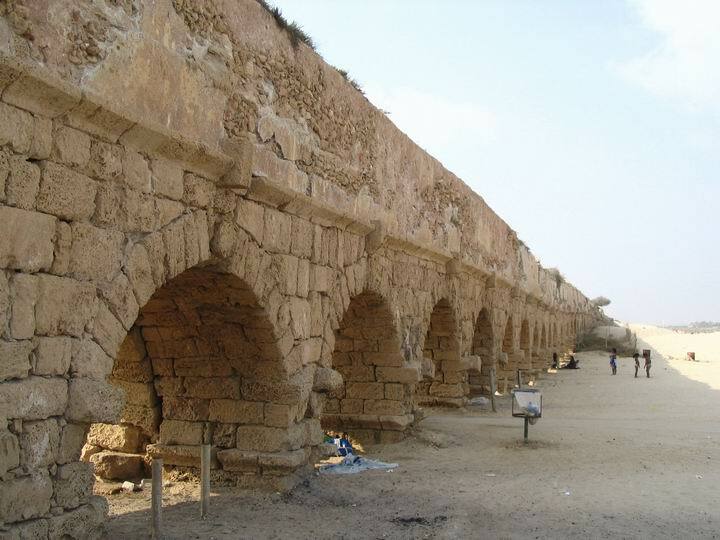 One of the famous sites in Caesarea is the Aqueduct, located to the north of the city. 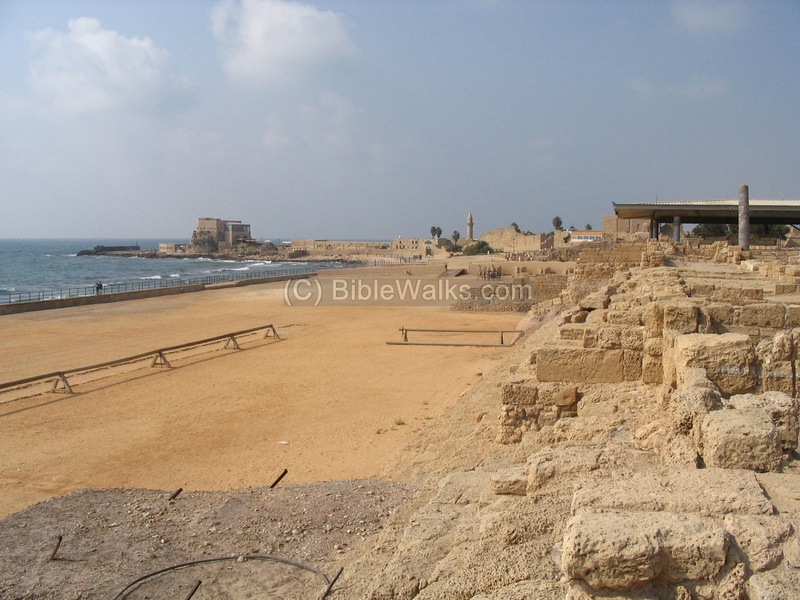 It is also a popular beach, accessed from the modern town of Caesarea. A closer view of the aqueduct is seen in the next photo. For more details, visit the page of the Caesarea Aqueduct. In 58AD the Apostle Paul, accused of causing a riot, was sent to Caesarea to stand trial before the governor. As a Roman citizen he requested to be heard by the Emperor , and so he sailed to Rome from Caesarea harbor. There, he was tried and executed after several years. 25:15 About whom, when I was at Jerusalem, the chief priests and the elders of the Jews informed me, desiring to have judgment against him. The "place of hearing", where this all happened, is located near Herod' palace, as seen in the following photo. An aerial view of the south side of ancient Caesarea can be seen in the following Youtube video.